There are two main types of cement: hydraulic and non-hydraulic. Both are used to construct buildings, homes, sidewalks and bridges, and to make repairs on properties and structures. There are several differences between the two, including how they are made and how long it takes for them to harden. In fact, non-hydraulic cement is used less in today's fast-paced construction because of the time and conditions needed for it to finish strengthening. 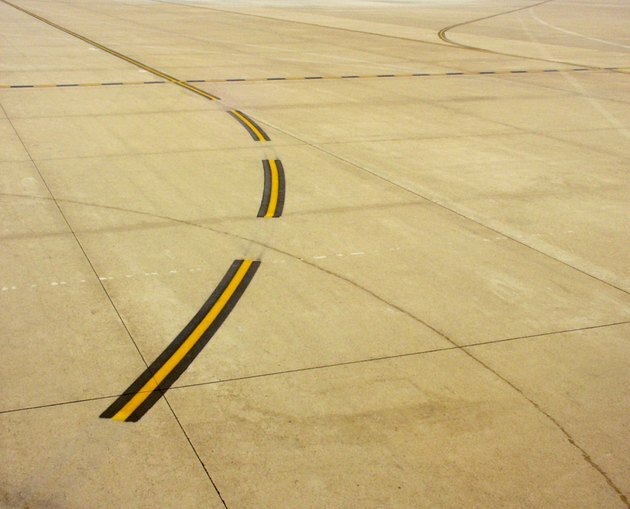 Airport runways are made from hydraulic cement. Some of the differences between hydraulic and non-hydraulic cement lie in the materials used to make them and the ways that they are formed. Hydraulic cement is a mixture of limestone, clay and gypsum which are burned together under extreme temperatures. The material used to make non-hydraulic cement include lime, gypsum plasters and oxychloride. Another difference between the two cements is the time it takes each to strengthen. Hydraulic cement starts to harden instantly and can be completed in as little as a few minutes if applied to small areas, or a few days for bigger projects. Non-hydraulic cement, on the other hand, takes longer to harden, which delays the completion of projects. The major difference between hydraulic and non-hydraulic cement is the hardening process. Hydraulic cement can harden while in contact with water. Non-hydraulic cement needs dry conditions to strengthen. This is a major advantage for hydraulic cement, as construction projects using this type of cement are completed in various weather conditions. Non-hydraulic cement was created first, but its limitations have propelled hydraulic cement's use in today's construction industry. Hydraulic cement's ability to harden underwater has made it the main type of cement used for those types of projects. Hydraulic cement is also preferred for minor repair work such as plugging holes and leaks in basements. Rod Howell is a writer living in Charlotte, N.C. He graduated from Thaddeus Stevens College with an associate degree in administration in 2000. He published the book "Capitol Conspiracy" and regularly contributes to a blog as well as various other websites, drawing frequently from his experience as an insurance agent.